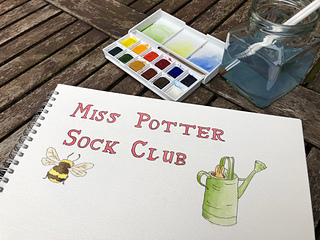 You can purchase the sock club here. 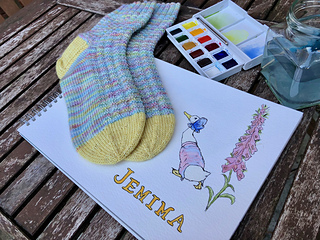 This is the first pattern in the collection and is inspired by Jemima Puddle-duck. The collection is inspired by Beatrix Potter and the wonderful friends that she created. Each pattern is themed around one of the characters, with the design taking inspiration from the stories that they appear in. All of the patterns are suitable for beginner knitters, to more experienced knitters. They suit all styles of yarn so you can be sure to find something that will work in your stash. All of the designs feature a heel flap and gusset construction and are knit from the top down. Instructions are given for Magic Loop but they can easily be knit with dpn’s if that is your preference. I used a contrast yarn for the heels and toes on all of the patterns, but that is by no means a requirement. Each of the patterns will include a bonus video tutorial on a certain aspect of sock knitting. These are all based on general sock knitting techniques, so can be used on any socks that you knit. This collection has been such a joyful experience for me to create. I’ve so enjoyed the whole process and I even did a little watercolour painting to accompany each pattern. 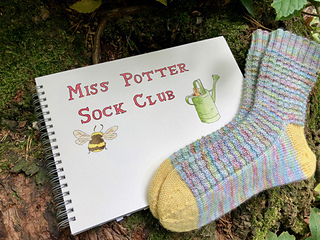 To join in the Miss Potter Sock Club fun, click here.